Decorative wood brackets adorn the front facing gables of this three bedroom home, filled with luxury and exceptional features. The covered front porch is an inviting entry into the two story foyer. A second floor loft area overlooks the foyer and the great room, which features a two story ceiling as well. The kitchen sports an angled countertop and is open to the breakfast bay and great room with fireplace and built-in shelves. The master suite is extraordinary with its rear wall of windows, tray ceiling, his and her walk-in closets, and opulent bath. 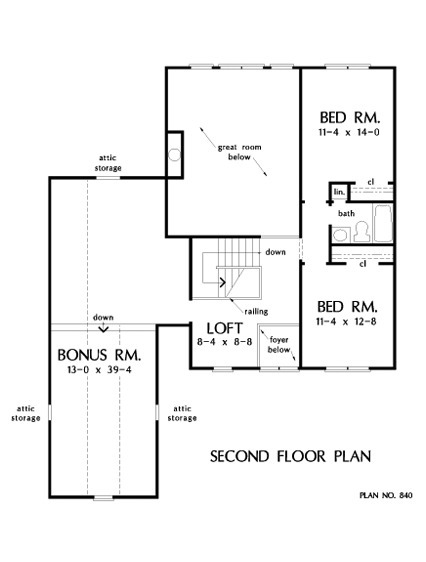 Upstairs, an oversized bonus room offers numerous options: recreation room, storage, or a fourth bedroom and bath. 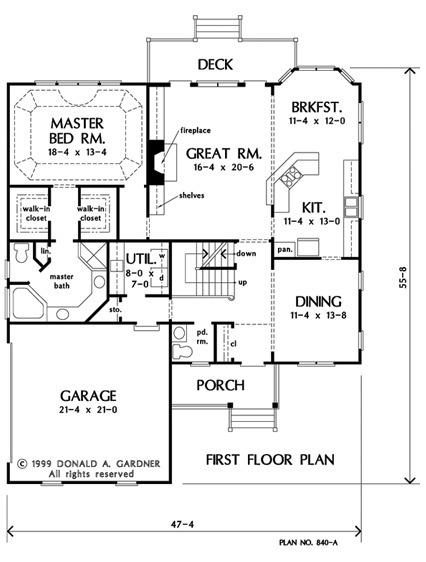 1st Floor: 1683 Sq. Ft. Bonus Room: 601 Sq. 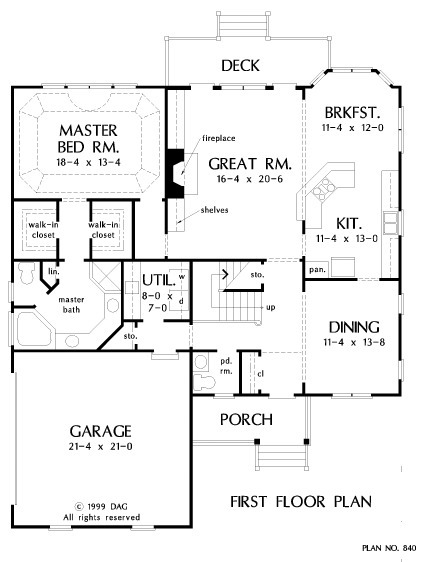 Ft.
House Dimensions: 47' 4" x 55' 8"
Master Bedroom: 18' 4" x 13' 4"
Porch - Front : 14' 4" x 6' 0" x 0' 0"
Deck / Patio : 20' 2" x 6' 0" x 0' 0"
Loft / Study : 8' 4" x 8' 8" x 8' 0"
Balcony : 5' 0" x 11' 4" x 8' 0"
Storage (Other) : 1' 8" x 3' 4" x 0' 0"
Bonus Room (Vaulted): 13' 0" x 39' 4" x 9' 5"
Master Bedroom (Tray): 18' 4" x 13' 4" x 11' 4"
Bedroom #2 : 11' 4" x 14' 0" x 8' 0"
Foyer (2 Story): 5' 0" x 5' 0" x 18' 0"
Dining Room : 11' 4" x 13' 8" x 9' 0"
Great Room (2 Story): 16' 4" x 20' 6" x 18' 0"